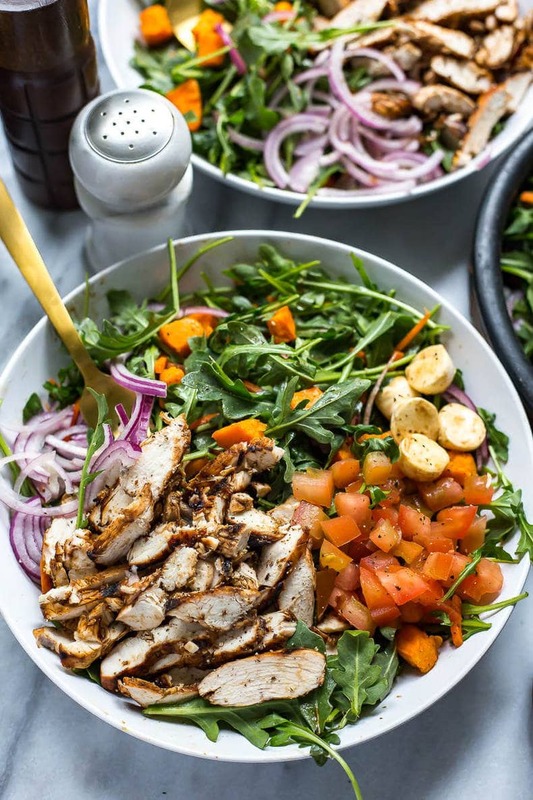 This Balsamic Grilled Chicken and Arugula Salad is a filling, low carb salad that uses a super easy balsamic dressing that doubles as a marinade – say hello to a 30 minute dinner! I could live on them, I swear. 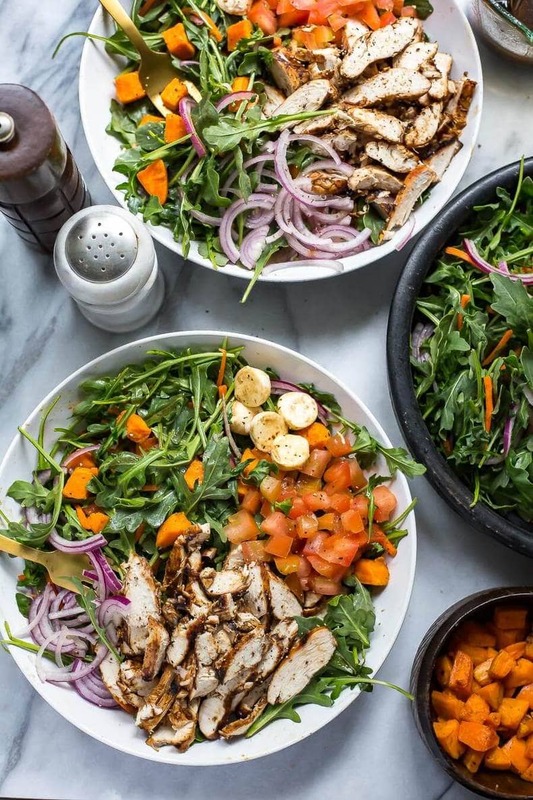 Humbly spoken of course, I think the very best kind has to be this Balsamic Grilled Chicken and Arugula Salad – these bowls are PACKED full of BBQ chicken, then filled with my very favourite type of greens and all kinds of veggies. Plus, the dressing doubles as a marinade so you basically just have to make one kind of sauce with no extra prep work needed! 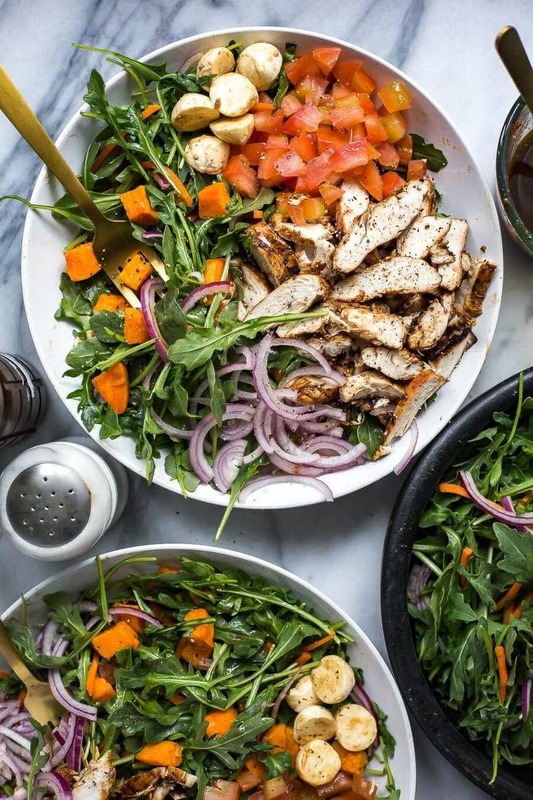 This Balsamic Grilled Chicken and Arugula Salad is a spin on one of my favourite salads at this small chain in Toronto called Aroma Espresso Bar. They legit have the BEST salads, and I know that's really saying something, because honestly, who pays for salad? I always thought that salads were one of those meals you can easily put together at home and I have always been adamant on trying something new whenever I go out to eat because the rare occasion I do, it's a special treat. I'm in love. They've got the right balance of textures and flavours, and the combos are unreal. I've kinda combined my two favourites off their menu as a matter of fact: their warm grilled chicken salad, and their sweet potato and lentil salad. 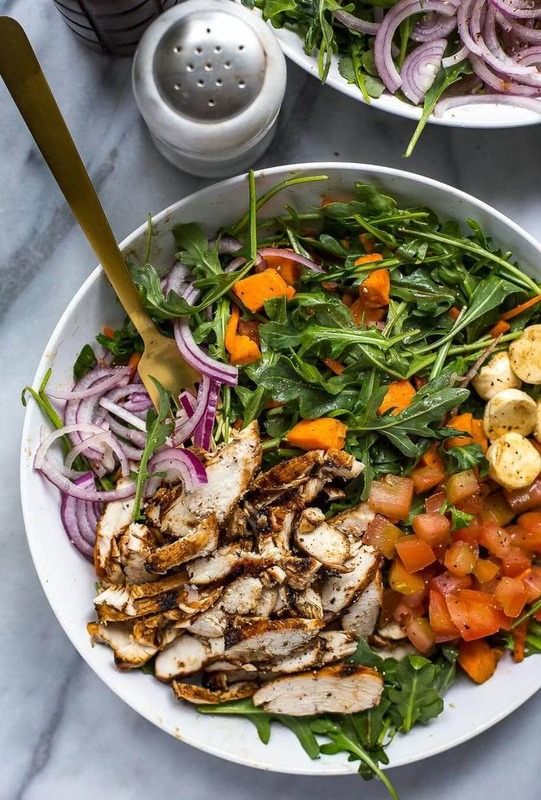 Gimme lots of arugula, roasted sweet potatoes, thinly sliced red onions and juicy, warm grilled chicken and ALL the bocconincini cheese please! There's something about a big bowl of greens that just makes you feel like you're doing something right in life, like you're really taking the time and effort to properly nourish your body. I went on two 10km jogs this past weekend all through the University of Toronto campus, then down across Queen's Park, a little slice of Yorkville and then down through Rosedale Valley Road, which exists in sort of a ravine and goes for 2 or so km without traffic lights. I can't even tell you how great it feels to be outside more often these days and just explore new territory. By the end of my little adventure I stopped in at one of my favourite grocery stores, Bloor Street Market, and grabbed all kinds of goodies. They've got these coconut chips that I die over and can't find anywhere else, and all different kinds of kombucha (I got this hibiscus kind…OMG so amazing) and a salad selection most grocery stores would envy. I say all of this because I think we just forget about the simple pleasures in life sometimes. You get so wrapped up in the day-to-day that you forget what it's like to take a bit of blissful free time and just kind of explore your own city and look around. Toronto is irreplaceable to me in this way. I mean, mostly for the food, but I AM a food blogger so I suppose this is to be expected! 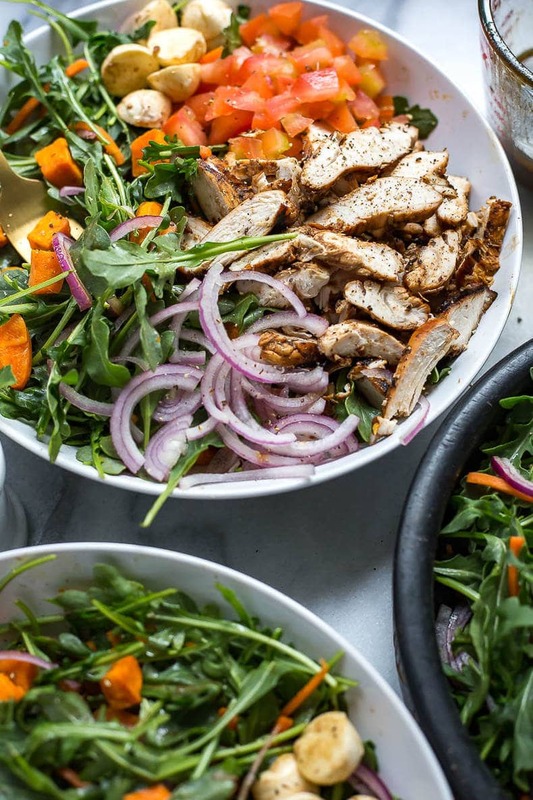 Now let's get into the nitty gritty of this Balsamic Grilled Chicken and Arugula Salad. You also want to make sure you cut the chicken breasts in half lengthwise so they'll cook faster. This is a recent discovery of mine and it's the trick to getting those thin chicken slices that you get when you order a salad out at a fancy restaurant. You definitely don't want to wait 25 minutes for your chicken to cook then have super thick slices that aren't evenly dressed in your marinade. I also recommend using plum tomatoes and slicing your red onions super, super thinly. 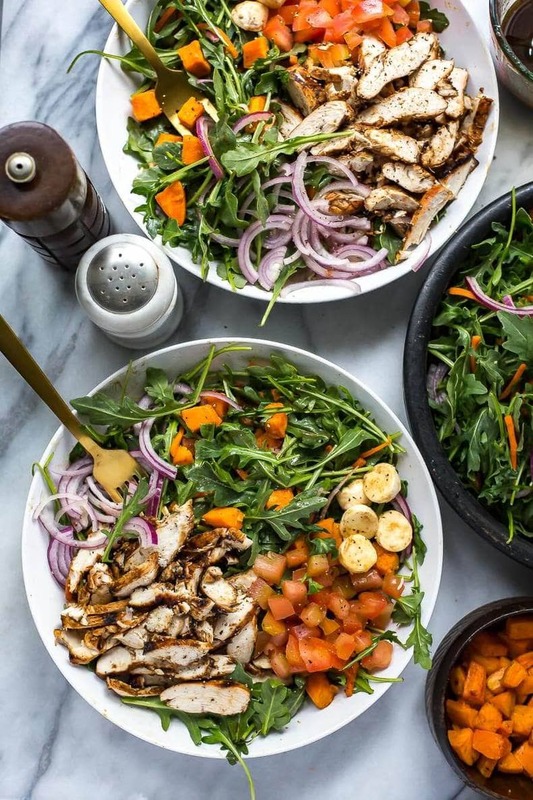 Keep the tomatoes separate if you don't want them to end up wilting your lettuce if you are packing this Balsamic Grilled Chicken and Arugula Salad up for leftovers the next day, and keep the dressing separate as well. I'm actually a huge fan of mason jar salads because you can keep the dressing the bottom with the meat so I recommend going this route and putting the dressing and chicken at the bottom of the jars, layering the tomato, sweet potato, onions, carrots and arugula on top in that order if you end up taking this salad for lunch. Also, I really highly recommend this salad for weekly lunch prep. It's so delicious! 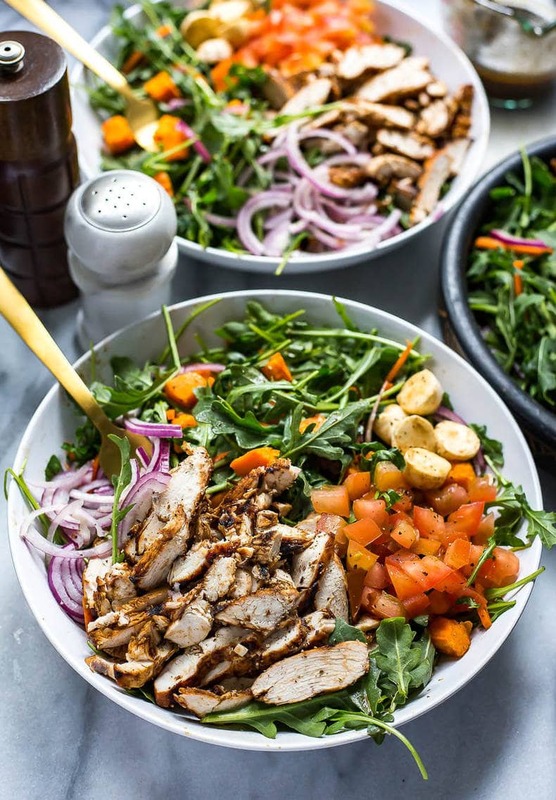 Will you be trying this Balsamic Grilled Chicken and Arugula Salad? I'm seriously hopping on board the summer salad train and never getting off. Let's see how many of these babies I can create this season! 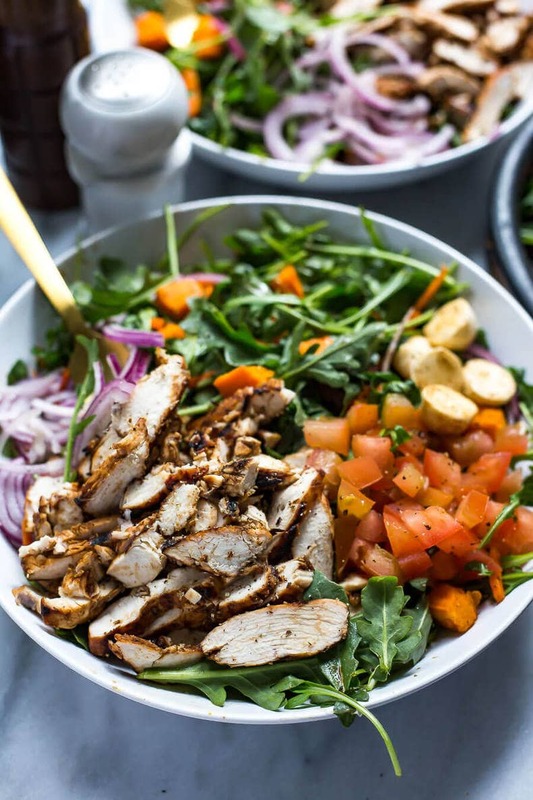 This Balsamic Grilled Chicken and Arugula Salad is a filling, low carb salad that uses a super easy balsamic dressing that doubles as a marinade - say hello to a 30 minute dinner! Preheat oven to 450 F. Toss sweet potatoes with olive oil and a little bit of salt and pepper, then roast in the oven for 20 minutes. Mix together ingredients for balsamic dressing/marinade, whisking together well. Cut chicken breasts in half lengthwise, then place chicken in a large plastic bag and pour half of the balsamic mixture into the bag and let chicken sit for 5-10 min. Preheat BBQ to med-high. Add chicken and grill for 12-15 minutes, flipping halfway through. Meanwhile, prepare veggies and slice bocconcini cheese balls in half. Remove chicken from heat and let cool, then thinly slice for salad. Arrange veggies, including roasted sweet potatoes, distributing evenly among four pasta bowls. 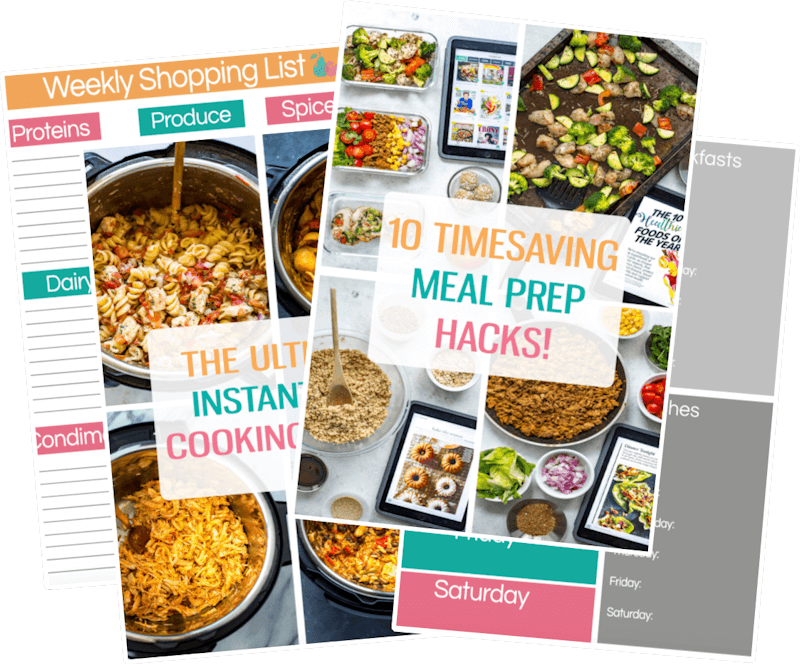 These are big servings of salad so you could even stretch it out into 6 servings if you're not feeling so hungry - I love this recipe because it doubles as leftover lunches for the next day. Mmmmmm, the perfect light and flavorful lunch bowl! That chicken looks to die for! Love, love the combo here and I could live on salads too, but only salads like this. I mean there are good salads…. and bad salads. 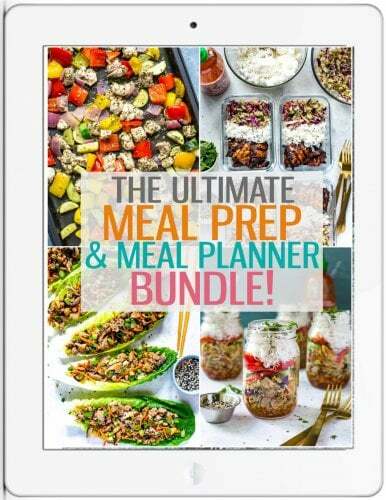 This is an awesome salad and I am so meal prepping this baby! Love this combo of ingredient! Just what I was looking for tonight! Do you know the calories for this salad for a full portion? Hey Kathy – so sorry but I don’t provide calories on my older recipes. It’s just impossible for me to go back through my archives and do them all. You can input the ingredients on an app like MyFitnessPal or MyPlate to get the calorie count. Hope that’s helpful! Loved it the sweet potato adds nice flavor! Taylor. Looks good, I’m going to try it. My girlfriend hates carrots, what would be some good substitutes? Also, never heard of this cheese., what’s it like? She also doesn’t like certain strong cheeses.